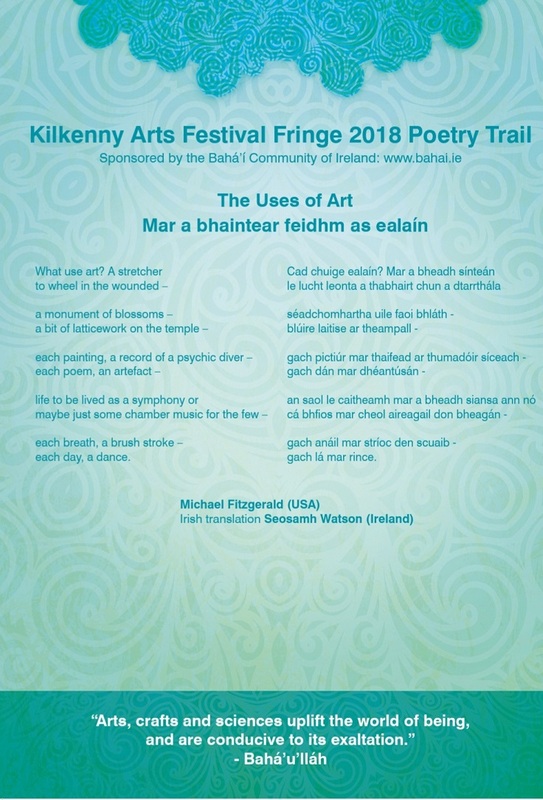 This past summer, in the city of Kilkenny in West Cork, Ireland, poems by five poets previously published in elixir-journal.org, were displayed along a poetry trail that wove through the city as part of the Kilkenny Arts Festival Fringe. 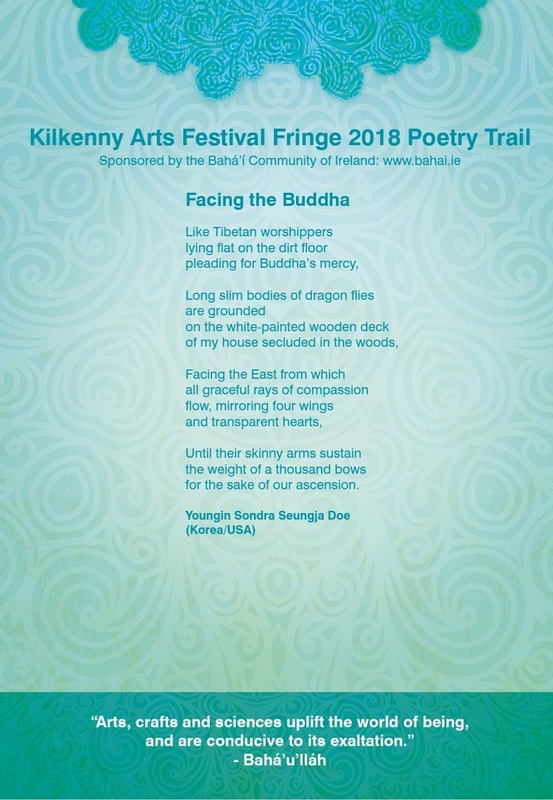 Created by Paddy Hanon, the large and beautifully designed posters featuring poems by Lynn Ascrizzi, Youngin Sondra SuengJa Doe, Michael Fitzgerald, Sandra Lynn Hutchison, and Valerie Senyk, appeared at various points along the trail. Ascrizzi’s “The Red Tree,” Doe’s “Facing the Buddha,” Fitzgerald’s “The Uses of Art” and “Song of the Planet,” Hutchison’s “Hejira” (from the long poem “Celestial Navigations”), and Senyk’s “Pilgrim Poem” were the poems chosen by Anton Floyd, curator of the Poetry Trail, which was sponsored by the Irish Bahá’í Summer School arts’ team and approved and set into motion by the Local Spiritual Assembly of Kilkenny. 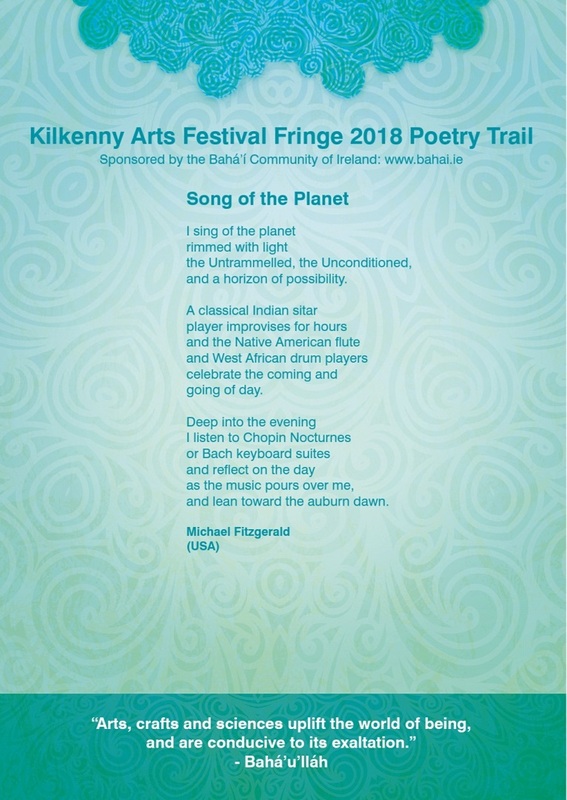 Two sets of posters were printed, one set for the Kilkenny Poetry Trail, and the other for display on the campus of the Irish Bahá’í summer school. Once the Fringe festival and the summer school ended, posters were sold, with proceeds going to the Bahá’í Fund. Some of the posters now adorn the walls of the Norwegian Haziratu’l-Quds in Oslo. Collected by editor Anton Floyd, the poems displayed along the Kilkenny Poetry Trail were published in an anthology of work entitled Point by Point, which appeared in the summer of 2018 and is available through the Irish Bahá’í Bookstore. The poets included in the anthology range from well known figures such as Tahirih and Robert Hayden to established contemporary poets and poets who are just emerging, all united in drawing upon a common source of inspiration: the spirit of the Bahá’í revelation. 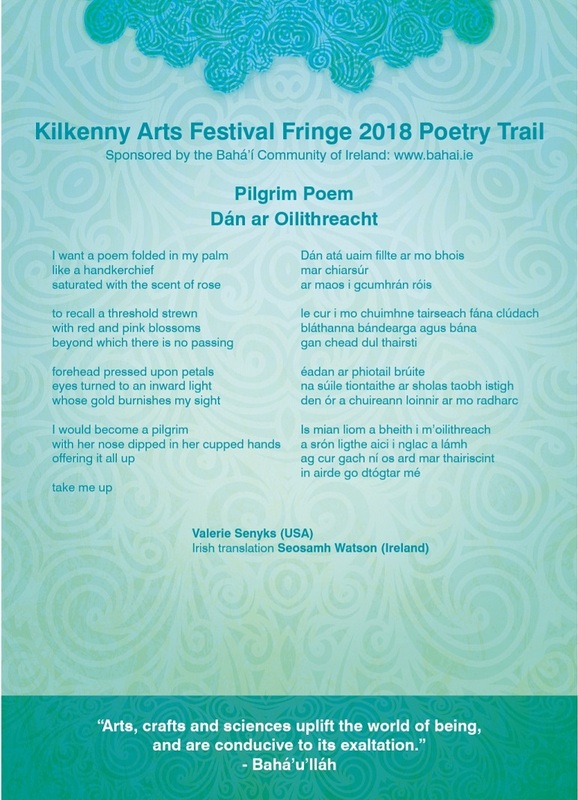 Poems by two of the e*lix*ir poets were translated into Irish by Seosamh Watson. A review of the volume appears in the “Looking Back on Books” section of this issue. 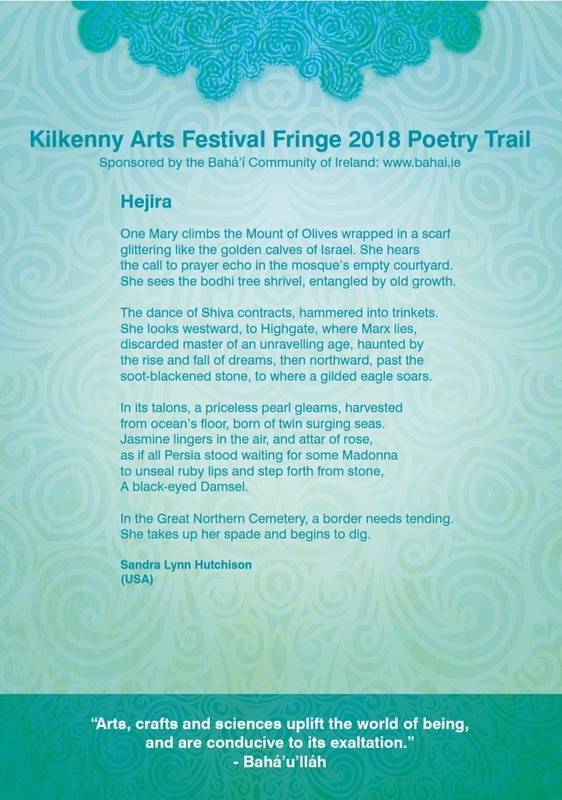 Anton Floyd is to be commended for his work in promoting the art of poetry within the Bahá’í community and for bringing the fine work of these five e*lix*ir poets to the Kilkenny Poetry Trail and the Irish Bahá’í Summer School.